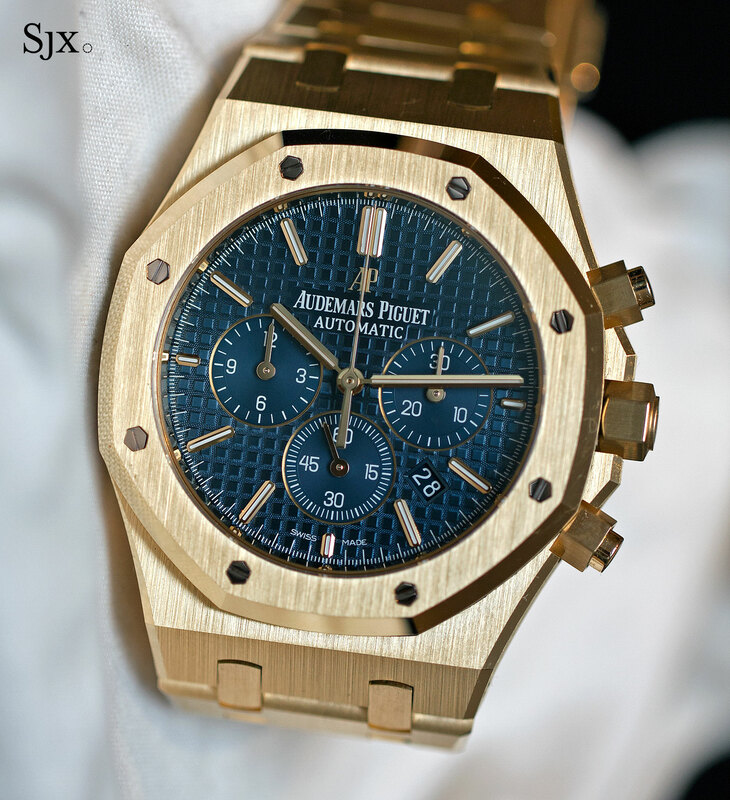 Audemars Piguet goes back to the classic shade of gold with the new Royal Oak Chronograph 41 mm (ref. 26320) in yellow gold. Gold, not mere gold, but gold, is usually thought of as yellow. Gold bullion, the stuff that gets stolen in films, is yellow gold. Despite its popularity amongst villains, this sort of gold has been out of fashion for some time. Pundits have predicted the return of yellow gold, but it hasn’t happened yet. 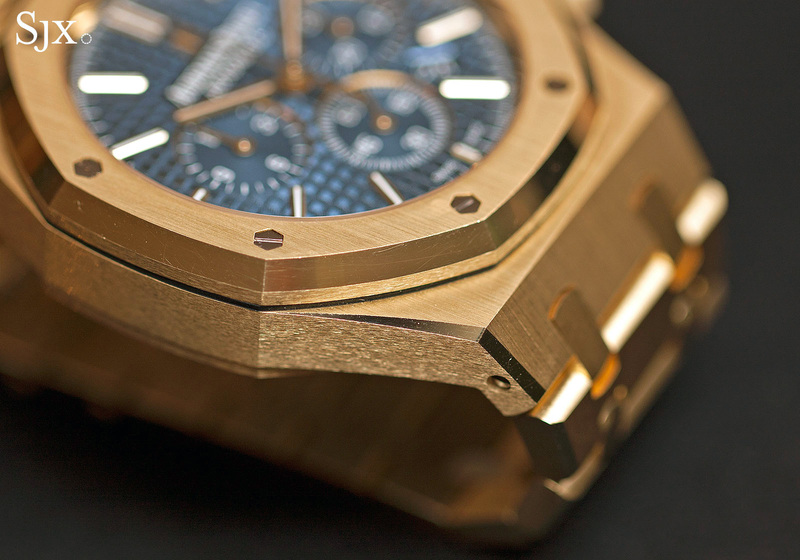 Paying no heed, Audemars Piguet has revived the Royal Oak in yellow gold. 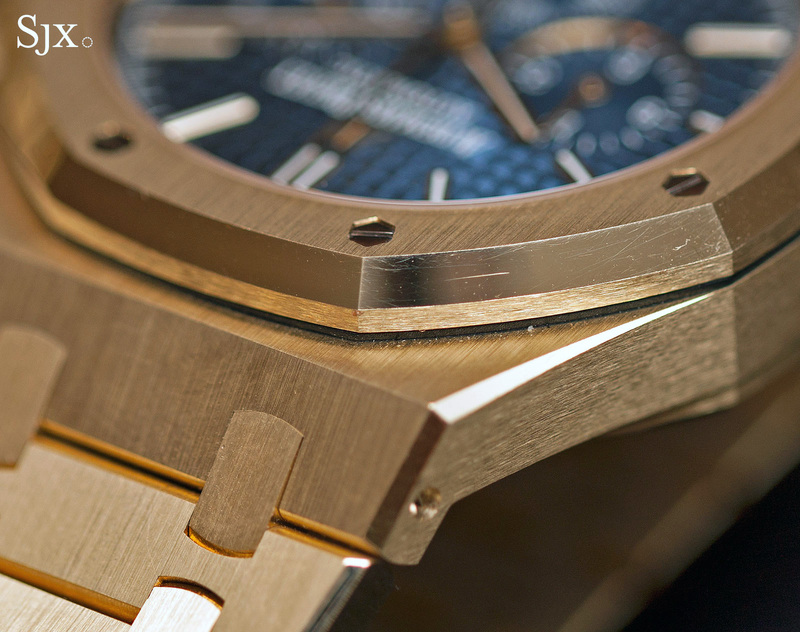 There is no other watch design that shows off the beauty of metal finishing better than the Royal Oak. None. Though the essential form of the watch is simple, octagonal and angular, the lines of the case, particularly its edges, are complex. Even the Patek Philippe Nautilus – a brother from another mother as one might say – has softer, rounder lines. 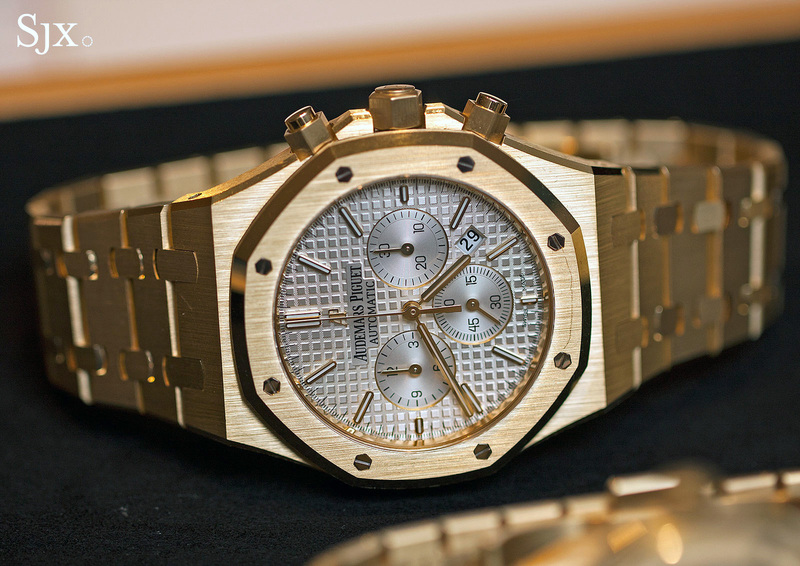 And so the Royal Oak in 18k gold is especially lustrous. 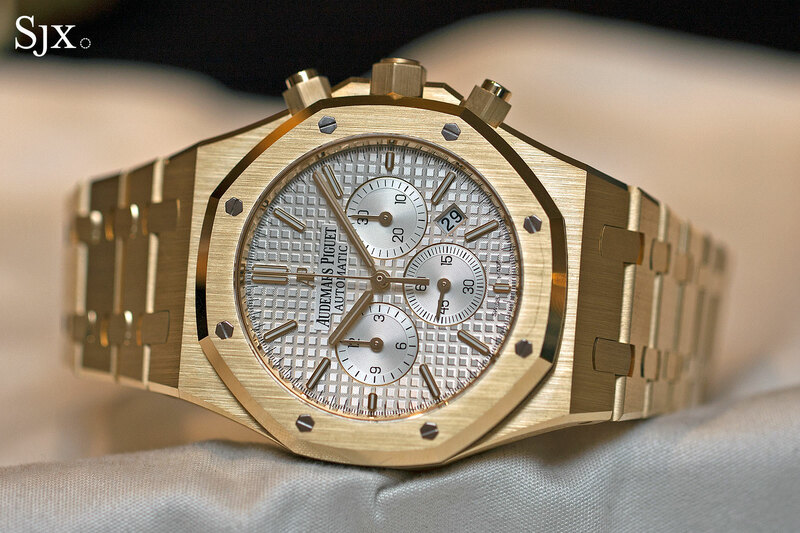 That lustre has only been available in rose gold, or occasionally platinum, until SIHH 2016, when Audemars Piguet debuted an entire line of Royal Oaks in yellow gold, including the Royal Oak Chronograph 41 mm (ref. 26320BA). The basics of the watch are identical to the stainless steel model: a 41 mm case with screw-down chronograph pushers and the Frederic Piguet calibre 1185 inside. The watch is large, chunky and gleaming. 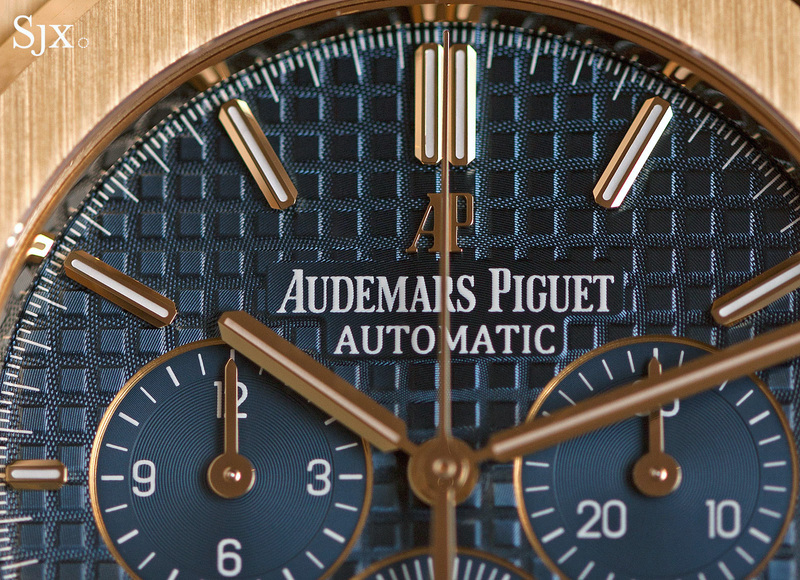 Because it’s so flashy, the nuance of the case finish can only be appreciated up close. It acquits itself very well that way, with wide, mirror-polished bevels and beautifully straight grained surfaces, intersected by a neat, precise edge. Even though the two surface finishes are very different, the edge where they meet is remarkably sharp; it’s hard to think of another watchmaker that finishes cases with such competence. Even the crown guards, which are basic forms in most other watches, are remarkably shaped and finished. All those beautiful sharp edges and angular forms have a downside though, the Royal Oak does not feel as smooth on the wrist as its peers (the Nautilus for instance), a sensation that’s even more pronounced with the weighty precious metal models. And another downside of the lovely case is how easily it scratches and scuffs. All the gorgeous, mirror-polished bevels mark exceptionally easier, as does the brushed top surfaces. Decorated with tapisserie guilloche, the dial is classic Royal Oak. 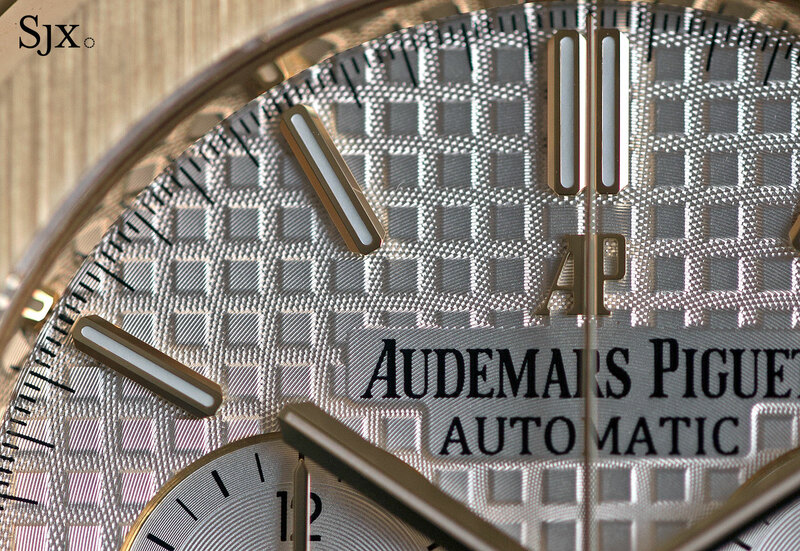 The very same motif found on the original 1972 Royal Oak “Jumbo”, it’s made up of tiny, raised squares along with extremely fine, overlapping concentric circles that are a result of the hand-operated engine-turning process. To match the case, the hands and hour markers are 18k yellow gold; the baton hour markers have lengthwise bevels and are impressively well-defined. 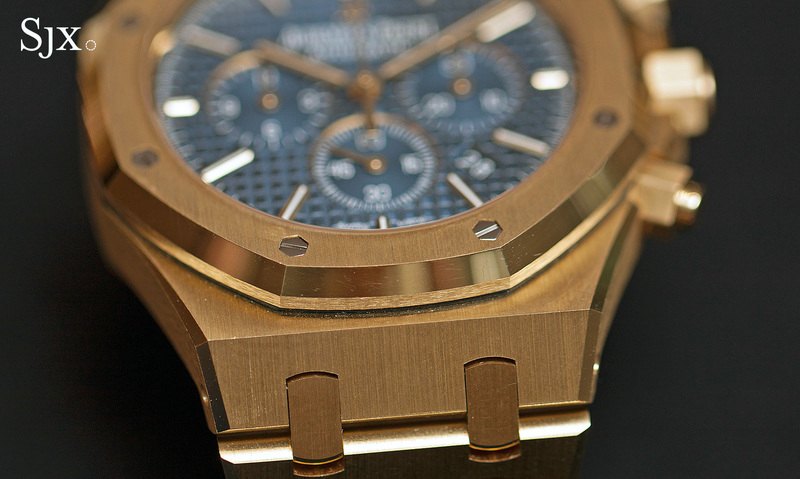 The greatest weakness of the Royal Oak Chronograph is its movement. 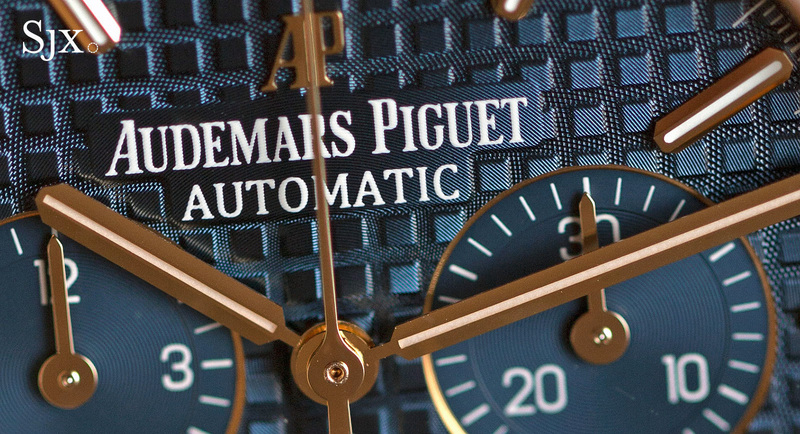 Termed the Audemars Piguet 2385, it is actually a Frederic Piguet calibre 1185. Though almost 30 years old, having been introduced in 1988, the 1185 remains one of the most compact chronograph movements on the market. Not only is it small, the refined 1185 is also an integrated construction with all the usual features associated with high-end chronographs, namely a column wheel and vertical clutch. A revolutionary development in its time, the 1185 influenced chronograph design in a major way, especially in the last decade, with movements from Omega, Panerai, Cartier and Rolex being similar in many respects. But fine as it is, the 1185 is not in-house. Rival luxury sports chronographs from Patek Philippe and Vacheron Constantin boast in-house movements (the new VC Overseas only just arrived this year). While having an in-house movement in itself means nothing, at this price point a well constructed and decently finished in-house movement is now the expectation given what its rivals are doing. 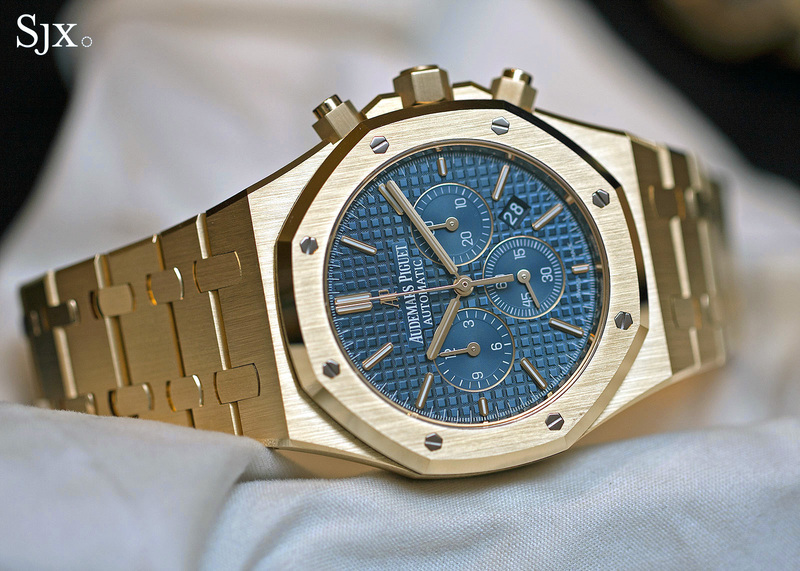 Already available in stores, the Royal Oak Chronograph 41 mm in yellow gold is priced at US$56,600 or S$79,400. It’s available with a silver dial (ref. 26320BA.OO.1220BA.01) or dark blue dial (ref. 26320BA.OO.1220BA.02).